Not for the first time, the spokesman for Greece’s far-right Golden Dawn party was in the spotlight for unbecoming conduct last Wednesday. He used profanity in parliament against a fellow member, who suggested that Golden Dawn did not suffer from a lack of invitations to televised debates, but failed to show up for them. It is precisely through a televised debate that Ilias Kasidiaris came to international fame. In June last year, he flung a glass of water in the face of another fellow Member of Parliament from the radical left Syriza party, and slapped a communist party MP who sat next to him. Networks carried the pictures around the world. On Wednesday he did not assault anyone, but even after his profanities were struck from parliamentary transcripts he escalated to calling all the other deputies in chamber a “bunch of coats” – football hooligan terminology for players not worth their salt. It was fairly standard in camera theatrical procedure for Golden Dawn, but nonetheless traumatic for politicians of a different generation. Golden Dawn, which is ostracised as a purely fascist movement by the other political parties in parliament and is suspected of orchestrating violence against immigrants, is increasingly a subject of public discourse. The party garnered seven percent of the vote last June, but its approval rating has reached almost double that figure in opinion polls conducted this year. It has fed off a cumulative recession that has claimed a fifth of the Greek economy and led to 27 percent unemployment – higher than in the US during the Great Depression. Dealing with the burgeoning Golden Dawn is dividing the rainbow coalition of conservatives, socialists and leftists. The senior coalition partner, the conservatives, have moved to protect their right flank. Last August they instituted a policy of police sweeps in city centres across Greece to pick up undocumented migrants and put them in detention camps. They may stay there for up to 18 months before being deported. In the autumn, Interior Minister Evripidis Stylianidis announced that the government would stiffen Greece’s liberal citizenship law, which the socialists passed in 2010. Prime Minister Antonis Samaras issued orders earlier this month for the new law to be prepared, after the Council of State ruled the 2010 law unconstitutional. The new law is expected to revoke resident EU nationals’ right to vote in local elections, and to allow only residence permits, not passports, for minors. 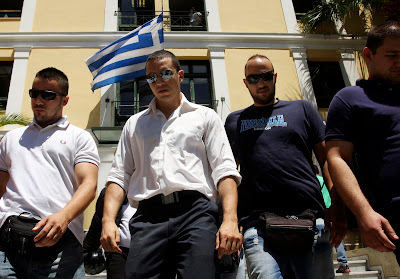 Greece’s growing xenophobia has elicited a very different reaction from the junior coalition partner, the socialists. On February 7, party leader Evangelos Venizelos declared that parliamentary majorities should be calculated on the basis of a 282-member chamber, excluding Golden Dawn’s 18 deputies. He does not want Golden Dawn’s MPs being allowed to represent parliament in international bodies like the Council of Europe; and he wants the rules of parliamentary behaviour tightened so that outbursts like those of Kasidiaris, which increasingly seem tactical rather than spontaneous, carry disciplinary consequences. Most importantly of all, Venizelos unveiled anti-racist legislation the socialists worked on before losing power. It would elevate racist crimes from misdemeanours to felonies, increase the penalties when such crimes are carried out by holders of political office, and extend a special form of residence permit to non-Greek witnesses in racist cases. While Golden Dawn is a bigger political headache to the conservatives, on whose voters the party preys, than to the socialists, the conservatives have never condemned the party in such unequivocal terms, or sought to confine them through the law. Yet polls are not rewarding the socialists. Recent soundings find them in inexorable decline as they bleed voters to the more radical left Syriza, while the conservatives seem to have suffered only minor attrition through their pursuit of austerity. Many observers believe that it is the counterweight of a nationalist social policy that has saved the conservatives. As Greek politics tend towards the extremes, there is little comfort in the thought that parties can either embrace the trend or die.